Heat 1 table spoon oil in a pan. 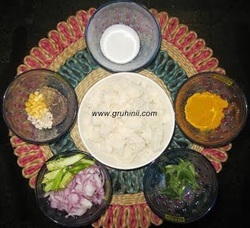 Add mustard seeds(rai) Let the rai seeds pop up , add jeera, urad dal, chana dal and hing. Stir until they turn to golden brown and add chopped onions, curry leaves and green chillies. Fry until onions turn pink, add haldi stir. To it add the idli crumbs, salt and sugar. Mix well reduce the flame, close the lid and cook for 2 to 3 mins. Switch off the flame take it into a serving plate garnish with fresh dhaniya leaves and fried cashew nuts. 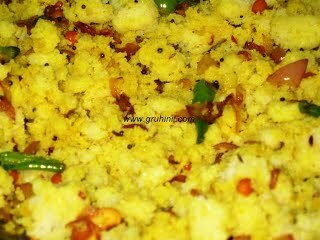 Idli Upma is ready ..............Serve hot with sauce or any chutney.